In March, Toccara Marlesha Huff, 33, and an accomplice were recorded by store surveillance cameras as they swiped $1478 in cologne and perfume from a Tampa business, police allege. 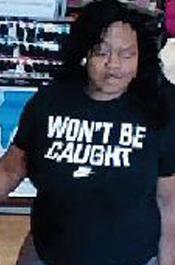 Police apprehended Huff in late-May and charged her with two felony counts in connection with the beauty store heist. Huff was released on $4000 bond, but when she failed to show for subsequent court hearings, an arrest warrant was issued for her. The fugitive--who is on probation--is a convicted felon whose rap sheet includes dozens of arrests over the past 15 years. Huff, seen in the below mug shot array, was released from state prison last November after serving 10 months for felony theft. According to investigators, Huff and her criminal associates have targeted high-end retailers, where they have boosted expensive clothing, sunglasses, and perfume. They often use lined “booster bags,” which can defeat the detection of theft monitoring devices attached to merchandise. While Huff remains on the lam, her alleged accomplice in the beauty store theft is being held without bond. Ayanna Palacio (seen above) is jailed on grand theft and probation violation charges, according to court records. Like Huff, Palacio, 38, is a convicted felon with a lengthy rap sheet. She was released from state prison in 2010 after serving about five years for armed robbery.